[manuka], aka [Stan Swan] is a teacher in New Zealand who enjoys enlightening his students on the wonders of electrical circuits. He primarily uses “snap connector” circuit kits, sold under the BrainBox name in NZ, for his interactive labs as they can be easily manipulated by pupils of all ages. 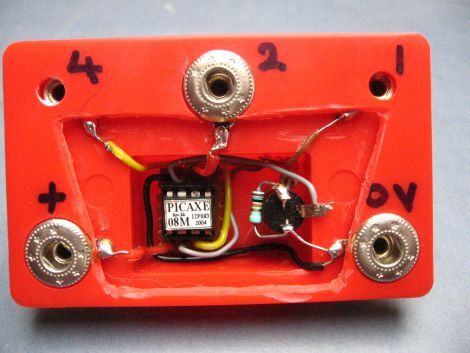 While the kits are great, he says that the range of experiments they provide can be a bit limited, so he decided to swap out the kit’s sound module for something far more useful – a PICAXE-08M. The space left by removing the sound module was pretty small, but [Stan] got everything to fit without too much hassle. His modification allows his students to program the PICAXE, as well as utilize four of the uC’s output pins. Needless to say, the addition of the PICAXE module was a huge hit with his students, allowing them to create far more exciting circuits. [Stan] has been revising his system over the years, adding extra output pins, enabling lamp and motor control, as well as tweaking his setup to respond to IR commands. We think [Stan’s] work is pretty awesome, and we’re still wondering how this flew under our radar for so long. He says that his students vary from preschool kids to centenarians, so if you’ve got someone that you would like to introduce to the fun world of electronics, we suggest picking up one of these kits and getting to work. Rube Goldberg machines are always a fan favorite around here. They truly embody the concept of over-engineering, and are an entertaining departure from what we normally cover on Hackaday. Back in February, engineering students from two on-campus professional associations at Purdue University teamed up to construct a world record-setting Rube Goldberg machine. Their entry in the Purdue Regional Rube Goldberg Machine Contest not only won them the regional title, but also potentially put them in the books as creating the most complex device of its nature. Their contraption was dubbed “The Time Machine” and acts out events in our planet’s history. It starts with the big bang, moving through various other time periods, including the stone age, ancient Egypt, and the medieval era. It also makes several stops in more recent times, including World War II and the Cold War, before self-destructing at the Apocalypse. All told, the machine incorporates 244 steps to water a plant, which is 14 more than the previous record holder. Continue reading to see a video that highlights some of the machine’s more interesting features, and be sure to check out these Rube Goldberg machines we’ve covered in the past.